Each Saturday throughout the year, Hollywood Heritage offers visitors the opportunity to see Hollywood from a historic point of view through weekly walking tours. Each tour begins each Saturday at 9:00 am at The Hollywood Heritage Museum located at 2100 N. Highland Avenue. The tour is 3 1/2 hours and ends at the Hollywood Roosevelt Hotel on Hollywood Blvd. Admission is $5 for Hollywood Heritage members and $10 for non-members. Advance reservations are a must, and the tour is limited to 10 people. Call (323) 465-6716 or click the title link for reservations and more info. Who says you have to be a visitor to be a tourist? Hmmm, interesting. 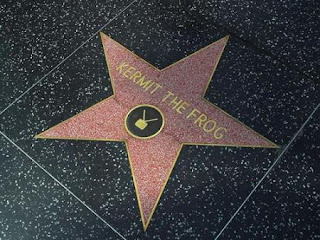 I didn't know Kermit had a star.